Maryam Maquillage: Better Than False Lashes! Salut mes belles! 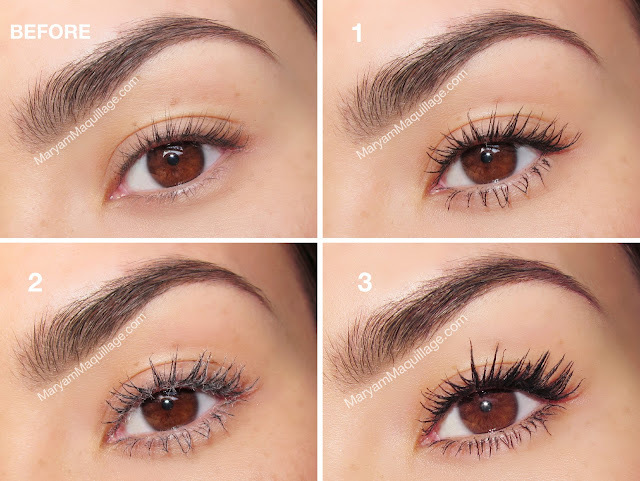 It's "Review ThuRsday", and today's feature is all about the lashes. In this post, I'm presenting the Too Faced Better Than False Lashes Nylon Lash Extension System, showing you a before and after, plus a step-by-step to help you achieve your biggest lashes without the use of falsies. 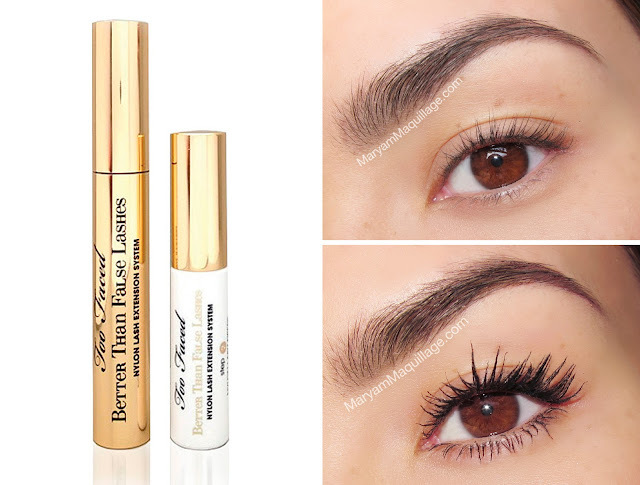 Too Faced Better Than False Lashes System comes with an activating Mascara base / top coat that primes and seals the lashes and a Lash Builder that uses nylon fibers to sculpt and thicken the lashes. The final look can be achieved in 3 easy steps and takes little to no time to apply. My natural lashes are pretty straight, sparse and short, so to prep them, I curled my top lashes with a lash curler. Prime: I used the activating mascara to create a base to adhere the nylon fibers. I'm generally not a big mascara wearer, so step 1 was enough of a result for me. My lashes were visibly longer and fuller. Build: I brushed on 2 coats of the Flexistretch nylon fibers to build length and volume. The fibers adhered well, but felt fuzzy in areas close to the lash roots. This step could be irritating to the eyes, so it is best to avoid the roots and apply the product from the middle of the lashes to the tips. Seal: I completed the application by sealing the fibers with the activating mascara top coat. I noticed that the mascara base had a moldable, sticky finish, so I used my fingers to push the lashes back to create a curve and preserve the curl of the lash. Step 4 (optional): I used a clean spoolie to brush out the lashes to separate them. Considering that my natural lashes are short, I'd say the result is pretty dramatic. There is a slight learning curve to this lash building system, and the application is a bit unusual -- however, with some practice, I feel like I could achieve even better results. I would totally wear Too Faced Better Than False Lashes mascara alone, even for a night out. My lashes have definitely been taken to a new height and I highly recommend this product to anyone looking for an alternative to falsies. Have you tried Too Faced Better Than False Lashes? I love this babe omg u look beautiful Im gonna get it! Wow! Your lashes look great, I am going to have to try this product out. OMG! The effect is SOOO dramatic! hi!! i'm a big fan of your blog , a lo ve everything thath u do..
if u says thath u not a big fan of wear mascara a lot, so do u only wear falsies on every look or how do u that??? kisses a lot from mexico! Hi!! Thank you so much for your kind words and for your question :)) I generally wear falsies on most of my blog posts, they just look better with most eye shadows :) In real life, I wear mascara during the day, but not every day :) Kisses from NY! thanks a lot 4 answer me, u're amazing and soooo cut and kind. It just takes a bit of practice, that's all :) Thanks my darling!! Tried it, hate it...$35 laying in my makeup drawer. i was having 2nd thoughts on purchasing this mascara but after reading your review, i will definitely buy 1 next time! :) your lashes look amazing! I have been dying to try this but the nylon fiber-y things kind of freak me out a bit! I tried this a few months ago because I have really short Asian eyelashes. Unfortunately, even if it lengthens it, it makes my lashes too heavy that it loses its curl immediately after application. If I curl it again, then I lose some of the mascara on the curler so it's useless. Maybe I should try this with a heated curler or something, any suggestions?